When looking at the best outdoor fire pits for your outdoor space, several designs are available. We will look at five different designs and give you the ability to choose what will work best for you. This free standing design will stand out by letting you see the fire from any angle. You can use it to cook your Smores or other small items for the grill. When assembled this pit will be 28 inches long, 24 1/2 inches deep, 40 inches tall and weight 40 pounds. Made of Black Powder Coated steel. Has screen made of high temperature material on all four sides for total viewing of your fire. Comes with tool for turning logs. Gives 360 degrees of fire viewing. Can cook small items on a stick. Good for warming a patio on cool evenings. Burns wood or fire logs. This design made from bronze will be great for the patio area as it will hold several logs in its deep bowl at one time. The grate can be used to sit the wood off of the bottom of the pit. It comes with a spark guard cover with a lifting hook. This pit is 31 inches wide rim to rim. It is 24 inches tall and weighs appoximatlly 30 pounds. This fire pit is made of a heavy bronze metal. It will take many years of use if cared for properly. 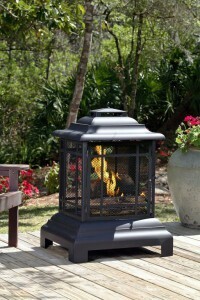 This table top heater will make your patio a warm conversation area even on the chilly nights. Power comes from a small propane tank that can be placed under the table out of the way. It will produce about 12,000 BTU's of heat. The bowl is filled with glass that can be ordered in different colors to match your decor. The bowl comes in black or brown and can be purchased in round or square designs. Attaches to the umbrella hole in most tables for stability. Although small in size it is perfect for a metal patio table. At 13 inches tall and 8 inches around, it will not block conversations and will give out a decent amount of heat. Base is made from a cast resin material. The bowl contains reflective glass available in 11 colors. Heating a small area. A conversation piece that can be changed with different colored glass in the bowl. Small propane canister(not included). Can be mounted below the table and the line run through the umbrella hole. This small Chimenea has a grate for cooking small items if needed. Great for sitting around your patio making smores. 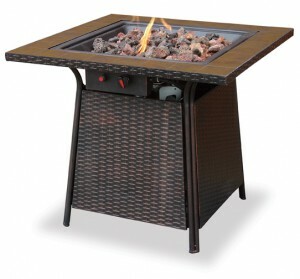 The smaller size of this fire pit will fit perfectly on a patio area with limited floor space. The front door will allow you to put wood in it or cook your snack. When closed it will keep the embers from jumping out while burning. This pit will be 43 inches tall and 18 inches around. It is not as big as some, but still produces a good amount of heat. Made from a cast Aluminum material that is very durable in the heat. You can cook a meal on this fire pit and also warm a small patio area for comfort. With the grate for cooking, you can even cook your hamburger or chicken for your friends as you sit and watch the flames. Each one of these fire pits will be a little different with the handcrafted marble tile mantle. The base is made of a durable material and has storage for your 20 pound propane tank. 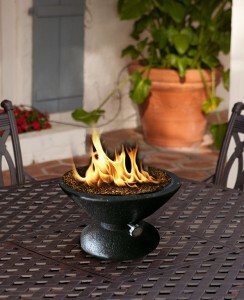 The porcelain steel bowl will hold your lava rocks that will help radiate the heat. This fire pit will produce around 30,000 BTU's of heat. It comes with a weather cover for protection when not in use. Fiberglass reinforced plastic panels make up the base of this unit. Mantle is constructed of hand made marble tiles. Fire bowl is made out of porcelain steel. Has a propane burner that will produce 30,000 BTU's of heat. It heats the lava rocks that are in the porcelain steel bowl to spread the heat for your comfort. Has an igniter to get your fire started with little or no effort. 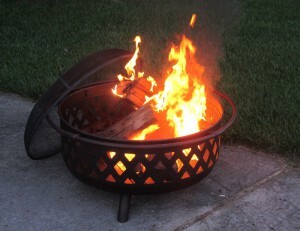 Several items are available for protection and ease of use for your fire pit. The number one thing to look for is a cover for your pit when not in use. This will extend the life of your pit for several years. Although they are made to sit in the weather, protection will help them last longer. Protection for your deck or patio area can be made by purchasing a Deck Protection Mat. These mats are made in several sizes and colors to protect a wooden or composite deck from heat damage. Items for storing and moving your wood will be needed if you have a wood burner. Log racks, Log movers and Log Grabbers are available in several sizes. Each of these low priced Fire Pits will have some features that you might find useful. I have given you a choice of several styles that can make your outside area more enjoyable on the cool evenings. These are some of the best outdoor fire pits in this price range. If you have any questions or comments on this post, please use the form below. Thanks for the designs. They would look great on the next fire I build outdoors. Just looking at these makes me want to just sit out in the evening and enjoy the warmth of the fire. Some nice fire pits and chimineas described here. I have a small semi-enclosed area with a roof in my garden. We get a lot of rain even in summer and I’d like to lengthen the time we can spend sitting out over the season. My question is – is a gas version really our only option if we want to use it in the sheltered area? Burning firewood means lot’s of smoke, watery eyes and choking. Thanks for the comments. Just giving ideas for your outdoor space. One of my favorite things to do in spring/summer is to hang out by my fireplace outside. I have one similar to the “Oil Rubbed Bronze with Criss-Cross design”, but mine had a very small wire design on the side. which eventually burned away with use. I think the one you suggested would last considerably longer due to the wide “criss-cross”. It would be the one I would get for myself. This is a very nice design to fit most patio area. It is small enough to take with you to tailgate if you want. I like the way your site is laid out. Easy to navigate and easy to read. For people who like to spend time outside there is no doubt, you have explained these products well. The sales pitch is just nice and not too pushy. I would buy from you if i was in line for this type of fire. Well we’ve been looking for some sort of outdoor heating system for our bbq area. The people we bought the house off did leave us a heater but it’s about 10 foot tall and weighs the same as a bus! They also left it behind the shed making it near enough impossible to get out! Would these pits work as a heating base for outdoor parties? Look at the outdoor heaters if you are just looking for heat. This post just deals with the table top models. I have some other models in the propane and electric heaters. I do use my portable fire pit for Halloween night, the neighbors come over for a party in the driveway, we do use it for heat this way. I like how everything is layed out, its easy to read and easy on the eyes too. Since winter is coming along soon my plan was to get a fire pit in the backyard so this guide is perfect for helping me get what I actually want. It would of been cool to see the weight of the other fire pits as well instead of just a couple of them. I will update the weights on these items, as this is the time of year that they are needed. interesting and very relevant to me as I have just built a new deck and am considering a fire pit that I can put on the deck instead of down on the lawn. I will certainly visit your website again to search for more ideas. Tons of good information and it looks like you are an expert in the field. These fire pits can be ordered with any logo that you want. I used the college for this time of the year. If your company or family would like something on this to make it more personal it can be done. This type of fire pit would look great on a deck, make sure you put a fire pad under it to keep from burning your deck surface. I like this site, you have most of the things covered for ones back yard, this is a struggle I have been fighting with for 15 years, because if I’m not camping I’m in my back yard. the only heading you don’t have is water features, ponds, pools, and waterfalls. those are some of the things I look for, but that is me I do like your site and your url. Very clean and your site is an add without pop ups NICE! I do have some water features, most are just water fountains. I did have a pond and pools at the last house not at this one. It would be a little easier to write about things that I have currently in my outdoor space.